1 A None No Power Seat 1 A is a standard First Class suite, however, the proximity to the bar may be bothersome. 1 E None No Power Seat 1 E is a standard First Class suite, however, the proximity to the bar may be bothersome. 1 F None No Power Seat 1 F is a standard First Class suite, however, the proximity to the bar may be bothersome. 1 K None No Power Seat 1 K is a standard First Class suite, however, the proximity to the bar may be bothersome. 10 B None No Power Seat 10 B is a standard Business seat. 10 D None No Power Seat 10 D is a standard Business seat. 10 G None No Power Seat 10 G is a standard Business seat. 10 J None No Power Seat 10 J is a standard Business seat. 11 A None No Power Seat 11 A is a standard Business seat. 11 E None No Power Seat 11 E is a standard Business seat. 11 F None No Power Seat 11 F is a standard Business seat. 11 K None No Power Seat 11 K is a standard Business seat. 12 B None No Power Seat 12 B is a standard Business seat. 12 D None No Power Seat 12 D is a standard Business seat. 12 G None No Power Seat 12 G is a standard Business seat. 12 J None No Power Seat 12 J is a standard Business seat. 14 A None No Power Seat 14 A is a standard Business seat. 14 E None No Power Seat 14 E is a standard Business seat. 14 F None No Power Seat 14 F is a standard Business seat. 14 K None No Power Seat 14 K is a standard Business seat. 15 B None No Power Seat 15 B is a standard Business seat. 15 D None No Power Seat 15 D is a standard Business seat. 15 G None No Power Seat 15 G is a standard Business seat. 15 J None No Power Seat 15 J is a standard Business seat. 16 A None No Power Seat 16 A is a standard Business seat. 16 E None No Power Seat 16 E is a standard Business seat. 16 F None No Power Seat 16 F is a standard Business seat. 16 K None No Power Seat 16 K is a standard Business seat. 17 B None No Power Seat 17 B is a standard Business seat. 17 D None No Power Seat 17 D is a standard Business seat. 17 G None No Power Seat 17 G is a standard Business seat. 17 J None No Power Seat 17 J is a standard Business seat. 18 A None No Power Seat 18 A is a standard Business seat. 18 E None No Power Seat 18 E is a standard Business seat. 18 F None No Power Seat 18 F is a standard Business seat. 18 K None No Power Seat 18 K is a standard Business seat. 19 B None No Power Seat 19 B is a standard Business seat. 19 D None No Power Seat 19 D is a standard Business seat. 19 G None No Power Seat 19 G is a standard Business seat. 19 J None No Power Seat 19 J is a standard Business seat. 2 A None No Power Seat 2 A is a standard First Class suite. 2 E None No Power Seat 2 E is a standard First Class suite. 2 F None No Power Seat 2 F is a standard First Class suite. 2 K None No Power Seat 2 K is a standard First Class suite. 20 A None No Power Seat 20 A is a standard Business seat. 20 E None No Power Seat 20 E is a standard Business seat. 20 F None No Power Seat 20 F is a standard Business seat. 20 K None No Power Seat 20 K is a standard Business seat. 21 B None No Power Seat 21 B is a standard Business seat. 21 D None No Power Seat 21 D is a standard Business seat. 21 G None No Power Seat 21 G is a standard Business seat. 21 J None No Power Seat 21 J is a standard Business seat. 22 D None No Power Seat 22 D is a Business Class Exit Row seat that has extra legroom. There is a bassinet location here, so passengers traveling with infants are often seated in this row. 22 G None No Power Seat 22 G is a Business Class Exit Row seat that has extra legroom. There is a bassinet location here, so passengers traveling with infants are often seated in this row. 23 A None No Power Seat 23 A is a Business Class Exit Row seat that has extra legroom. 23 E None No Power Seat 23 E is a standard Business seat. 23 F None No Power Seat 23 F is a standard Business seat. 23 K None No Power Seat 23 K is a Business Class Exit Row seat that has extra legroom. 24 B None No Power Seat 24 B is a standard Business seat. 24 D None No Power Seat 24 D is a standard Business seat. 24 G None No Power Seat 24 G is a standard Business seat. 24 J None No Power Seat 24 J is a standard Business seat. 25 A None No Power Seat 25 A is a standard Business seat. 25 E None No Power Seat 25 E is a standard Business seat. 25 F None No Power Seat 25 F is a standard Business seat. 25 K None No Power Seat 25 K is a standard Business seat. 26 B None No Power Seat 26 B is a standard Business seat, however, the proximity to the lavatory and bar may be bothersome. 26 D None No Power Seat 26 D is a standard Business seat, however, the proximity to the lavatory and bar may be bothersome. 26 G None No Power Seat 26 G is a standard Business seat, however, the proximity to the lavatory and bar may be bothersome. 26 J None No Power Seat 26 J is a standard Business seat, however, the proximity to the lavatory and bar may be bothersome. 3 A None No Power Seat 3 A is a standard First Class suite. 3 E None No Power Seat 3 E is a standard First Class suite. 3 F None No Power Seat 3 F is a standard First Class suite. 3 K None No Power Seat 3 K is a standard First Class suite. 4 A None No Power Seat 4 A is a standard First Class suite, however, the proximity to the lavatory and galley may be bothersome. 4 K None No Power Seat 4 K is a standard First Class suite, however, the proximity to the lavatory and galley may be bothersome. 41 A None No Power Seat 41 A is a standard Economy seat that has extra legroom however, it may be impeded by the protrusion of the exit door. The proximity to the lavatories may be bothersome. 41 B None No Power Seat 41 B is a standard Economy seat that has extra legroom however, the proximity to the lavatories may be bothersome. 41 C None No Power Seat 41 C is a standard Economy seat that has extra legroom however, the proximity to the lavatories may be bothersome. 41 H None No Power Seat 41 H is a standard Economy seat that has extra legroom however, the proximity to the lavatories may be bothersome. 41 J None No Power Seat 41 J is a standard Economy seat that has extra legroom however, the proximity to the lavatories may be bothersome. 41 K None No Power Seat 41 K is a standard Economy seat that has extra legroom however, it may be impeded by the protrusion of the exit door. The proximity to the lavatories may be bothersome. 42 A None No Power Seat 42 A is a standard Economy seat. 42 B None No Power Seat 42 B is a standard Economy seat. 42 C None No Power Seat 42 C is a standard Economy seat. 42 H None No Power Seat 42 H is a standard Economy seat. 42 J None No Power Seat 42 J is a standard Economy seat. 42 K None No Power Seat 42 K is a standard Economy seat. 43 A None No Power Seat 43 A is a standard Economy seat. 43 B None No Power Seat 43 B is a standard Economy seat. 43 C None No Power Seat 43 C is a standard Economy seat. 43 H None No Power Seat 43 H is a standard Economy seat. 43 J None No Power Seat 43 J is a standard Economy seat. 43 K None No Power Seat 43 K is a standard Economy seat. 44 A None No Power Seat 44 A is a standard Economy seat. 44 B None No Power Seat 44 B is a standard Economy seat. 44 C None No Power Seat 44 C is a standard Economy seat. 44 H None No Power Seat 44 H is a standard Economy seat. 44 J None No Power Seat 44 J is a standard Economy seat. 44 K None No Power Seat 44 K is a standard Economy seat. 45 A None No Power Seat 45 A is a standard Economy seat. 45 B None No Power Seat 45 B is a standard Economy seat. 45 C None No Power Seat 45 C is a standard Economy seat. 45 D None No Power Seat 45 D has extra legroom. There is a bassinet location here, so passengers traveling with infants are often seated in this row. 45 E None No Power Seat 45 E has extra legroom. There is a bassinet location here, so passengers traveling with infants are often seated in this row. 45 F None No Power Seat 45 F has extra legroom. There is a bassinet location here, so passengers traveling with infants are often seated in this row. 45 G None No Power Seat 45 G has extra legroom. There is a bassinet location here, so passengers traveling with infants are often seated in this row. 45 H None No Power Seat 45 H is a standard Economy seat. 45 J None No Power Seat 45 J is a standard Economy seat. 45 K None No Power Seat 45 K is a standard Economy seat. 46 A None No Power Seat 46 A is a standard Economy seat. 46 B None No Power Seat 46 B is a standard Economy seat. 46 C None No Power Seat 46 C is a standard Economy seat. 46 D None No Power Seat 46 D is a standard Economy seat. 46 E None No Power Seat 46 E is a standard Economy seat. 46 F None No Power Seat 46 F is a standard Economy seat. 46 G None No Power Seat 46 G is a standard Economy seat. 46 H None No Power Seat 46 H is a standard Economy seat. 46 J None No Power Seat 46 J is a standard Economy seat. 46 K None No Power Seat 46 K is a standard Economy seat. 47 A None No Power Seat 47 A is a standard Economy seat. 47 B None No Power Seat 47 B is a standard Economy seat. 47 C None No Power Seat 47 C is a standard Economy seat. 47 D None No Power Seat 47 D is a standard Economy seat. 47 E None No Power Seat 47 E is a standard Economy seat. 47 F None No Power Seat 47 F is a standard Economy seat. 47 G None No Power Seat 47 G is a standard Economy seat. 47 H None No Power Seat 47 H is a standard Economy seat. 47 J None No Power Seat 47 J is a standard Economy seat. 47 K None No Power Seat 47 K is a standard Economy seat. 48 A None No Power Seat 48 A is a standard Economy seat. 48 B None No Power Seat 48 B is a standard Economy seat. 48 C None No Power Seat 48 C is a standard Economy seat. 48 D None No Power Seat 48 D is a standard Economy seat. 48 E None No Power Seat 48 E is a standard Economy seat. 48 F None No Power Seat 48 F is a standard Economy seat. 48 G None No Power Seat 48 G is a standard Economy seat. 48 H None No Power Seat 48 H is a standard Economy seat. 48 J None No Power Seat 48 J is a standard Economy seat. 48 K None No Power Seat 48 K is a standard Economy seat. 49 A None No Power Seat 49 A is a standard Economy seat. 49 B None No Power Seat 49 B is a standard Economy seat. 49 C None No Power Seat 49 C is a standard Economy seat. 49 D None No Power Seat 49 D is a standard Economy seat. 49 E None No Power Seat 49 E is a standard Economy seat. 49 F None No Power Seat 49 F is a standard Economy seat. 49 G None No Power Seat 49 G is a standard Economy seat. 49 H None No Power Seat 49 H is a standard Economy seat. 49 J None No Power Seat 49 J is a standard Economy seat. 49 K None No Power Seat 49 K is a standard Economy seat. 50 A None No Power Seat 50 A has limited recline. The proximity to the galley may be bothersome. 50 B None No Power Seat 50 B has limited recline. The proximity to the galley may be bothersome. 50 C None No Power Seat 50 C has limited recline. The proximity to the galley may be bothersome. 50 D None No Power Seat 50 D is a standard Economy seat. 50 E None No Power Seat 50 E is a standard Economy seat. 50 F None No Power Seat 50 F is a standard Economy seat. 50 G None No Power Seat 50 G is a standard Economy seat. 50 H None No Power Seat 50 H has limited recline. The proximity to the galley may be bothersome. 50 J None No Power Seat 50 J has limited recline. The proximity to the galley may be bothersome. 50 K None No Power Seat 50 K has limited recline. The proximity to the galley may be bothersome. 51 D None No Power Seat 51 D has limited recline. The proximity to the galley may be bothersome. 51 E None No Power Seat 51 E has limited recline. The proximity to the galley may be bothersome. 51 F None No Power Seat 51 F has limited recline. The proximity to the galley may be bothersome. 51 G None No Power Seat 51 G has limited recline. The proximity to the galley may be bothersome. 52 A None No Power Seat 52 A has extra legroom. The proximity to the galley may be bothersome. There is a bassinet location here, so passengers traveling with infants are often seated in this row. 52 B None No Power Seat 52 B has extra legroom. The proximity to the galley may be bothersome. There is a bassinet location here, so passengers traveling with infants are often seated in this row. 52 C None No Power Seat 52 C has extra legroom. The proximity to the galley may be bothersome. There is a bassinet location here, so passengers traveling with infants are often seated in this row. 52 H None No Power Seat 52 H has extra legroom. The proximity to the galley may be bothersome. There is a bassinet location here, so passengers traveling with infants are often seated in this row. 52 J None No Power Seat 52 J has extra legroom. The proximity to the galley may be bothersome. There is a bassinet location here, so passengers traveling with infants are often seated in this row. 52 K None No Power Seat 52 K has extra legroom. The proximity to the galley may be bothersome. There is a bassinet location here, so passengers traveling with infants are often seated in this row. 53 A None No Power Seat 53 A is a standard Economy seat. 53 B None No Power Seat 53 B is a standard Economy seat. 53 C None No Power Seat 53 C is a standard Economy seat. 53 H None No Power Seat 53 H is a standard Economy seat. 53 J None No Power Seat 53 J is a standard Economy seat. 53 K None No Power Seat 53 K is a standard Economy seat. 54 A None No Power Seat 54 A is a standard Economy seat. 54 B None No Power Seat 54 B is a standard Economy seat. 54 C None No Power Seat 54 C is a standard Economy seat. 54 D None No Power Seat 54 D has extra legroom. There is a bassinet location here, so passengers traveling with infants are often seated in this row. 54 E None No Power Seat 54 E has extra legroom. There is a bassinet location here, so passengers traveling with infants are often seated in this row. 54 F None No Power Seat 54 F has extra legroom. There is a bassinet location here, so passengers traveling with infants are often seated in this row. 54 G None No Power Seat 54 G has extra legroom. There is a bassinet location here, so passengers traveling with infants are often seated in this row. 54 H None No Power Seat 54 H is a standard Economy seat. 54 J None No Power Seat 54 J is a standard Economy seat. 54 K None No Power Seat 54 K is a standard Economy seat. 55 A None No Power Seat 55 A is a standard Economy seat. 55 B None No Power Seat 55 B is a standard Economy seat. 55 C None No Power Seat 55 C is a standard Economy seat. 55 D None No Power Seat 55 D is a standard Economy seat. 55 E None No Power Seat 55 E is a standard Economy seat. 55 F None No Power Seat 55 F is a standard Economy seat. 55 G None No Power Seat 55 G is a standard Economy seat. 55 H None No Power Seat 55 H is a standard Economy seat. 55 J None No Power Seat 55 J is a standard Economy seat. 55 K None No Power Seat 55 K is a standard Economy seat. 58 A None No Power Seat 58 A is a standard Economy seat. 58 B None No Power Seat 58 B is a standard Economy seat. 58 C None No Power Seat 58 C is a standard Economy seat. 58 D None No Power Seat 58 D is a standard Economy seat. 58 E None No Power Seat 58 E is a standard Economy seat. 58 F None No Power Seat 58 F is a standard Economy seat. 58 G None No Power Seat 58 G is a standard Economy seat. 58 H None No Power Seat 58 H is a standard Economy seat. 58 J None No Power Seat 58 J is a standard Economy seat. 58 K None No Power Seat 58 K is a standard Economy seat. 59 A None No Power Seat 59 A is a standard Economy seat. 59 B None No Power Seat 59 B is a standard Economy seat. 59 C None No Power Seat 59 C is a standard Economy seat. 59 D None No Power Seat 59 D is a standard Economy seat. 59 E None No Power Seat 59 E is a standard Economy seat. 59 F None No Power Seat 59 F is a standard Economy seat. 59 G None No Power Seat 59 G is a standard Economy seat. 59 H None No Power Seat 59 H is a standard Economy seat. 59 J None No Power Seat 59 J is a standard Economy seat. 59 K None No Power Seat 59 K is a standard Economy seat. 6 D None No Power Seat 6 D is a standard Business seat, however, the proximity to the lavatory and galley may be bothersome. There is a bassinet location here, so passengers traveling with infants are often seated in this row. 6 G None No Power Seat 6 G is a standard Business seat, however, the proximity to the lavatory and galley may be bothersome. There is a bassinet location here, so passengers traveling with infants are often seated in this row. 60 A None No Power Seat 60 A is a standard Economy seat. 60 B None No Power Seat 60 B is a standard Economy seat. 60 C None No Power Seat 60 C is a standard Economy seat. 60 D None No Power Seat 60 D is a standard Economy seat. 60 E None No Power Seat 60 E is a standard Economy seat. 60 F None No Power Seat 60 F is a standard Economy seat. 60 G None No Power Seat 60 G is a standard Economy seat. 60 H None No Power Seat 60 H is a standard Economy seat. 60 J None No Power Seat 60 J is a standard Economy seat. 60 K None No Power Seat 60 K is a standard Economy seat. 61 A None No Power Seat 61 A is a standard Economy seat. 61 B None No Power Seat 61 B is a standard Economy seat. 61 C None No Power Seat 61 C is a standard Economy seat. 61 D None No Power Seat 61 D is a standard Economy seat. 61 E None No Power Seat 61 E is a standard Economy seat. 61 F None No Power Seat 61 F is a standard Economy seat. 61 G None No Power Seat 61 G is a standard Economy seat. 61 H None No Power Seat 61 H is a standard Economy seat. 61 J None No Power Seat 61 J is a standard Economy seat. 61 K None No Power Seat 61 K is a standard Economy seat. 62 A None No Power Seat 62 A is a standard Economy seat. 62 B None No Power Seat 62 B is a standard Economy seat. 62 C None No Power Seat 62 C is a standard Economy seat. 62 D None No Power Seat 62 D is a standard Economy seat. 62 E None No Power Seat 62 E is a standard Economy seat. 62 F None No Power Seat 62 F is a standard Economy seat. 62 G None No Power Seat 62 G is a standard Economy seat. 62 H None No Power Seat 62 H is a standard Economy seat. 62 J None No Power Seat 62 J is a standard Economy seat. 62 K None No Power Seat 62 K is a standard Economy seat. 63 A None No Power Seat 63 A is a standard Economy seat. 63 B None No Power Seat 63 B is a standard Economy seat. 63 C None No Power Seat 63 C is a standard Economy seat. 63 D None No Power Seat 63 D is a standard Economy seat. 63 E None No Power Seat 63 E is a standard Economy seat. 63 F None No Power Seat 63 F is a standard Economy seat. 63 G None No Power Seat 63 G is a standard Economy seat. 63 H None No Power Seat 63 H is a standard Economy seat. 63 J None No Power Seat 63 J is a standard Economy seat. 63 K None No Power Seat 63 K is a standard Economy seat. 64 A None No Power Seat 64 A is a standard Economy seat. 64 B None No Power Seat 64 B is a standard Economy seat. 64 C None No Power Seat 64 C is a standard Economy seat. 64 D None No Power Seat 64 D is a standard Economy seat. 64 E None No Power Seat 64 E is a standard Economy seat. 64 F None No Power Seat 64 F is a standard Economy seat. 64 G None No Power Seat 64 G is a standard Economy seat. 64 H None No Power Seat 64 H is a standard Economy seat. 64 J None No Power Seat 64 J is a standard Economy seat. 64 K None No Power Seat 64 K is a standard Economy seat. 65 A None No Power Seat 65 A has limited recline. The proximity to the lavatory may be bothersome. 65 B None No Power Seat 65 B has limited recline. The proximity to the lavatory may be bothersome. 65 C None No Power Seat 65 C has limited recline. The proximity to the lavatory may be bothersome. 65 D None No Power Seat 65 D has limited recline. The proximity to the lavatory may be bothersome. 65 E None No Power Seat 65 E has limited recline. The proximity to the lavatory may be bothersome. 65 F None No Power Seat 65 F has limited recline. The proximity to the lavatory may be bothersome. 65 G None No Power Seat 65 G has limited recline. The proximity to the lavatory may be bothersome. 65 H None No Power Seat 65 H is a standard Economy seat, however, the proximity to the lavatory may be bothersome. 65 J None No Power Seat 65 J is a standard Economy seat. 65 K None No Power Seat 65 K is a standard Economy seat. 66 H None No Power Seat 66 H has limited recline. The proximity to the lavatory may be bothersome. 66 J None No Power Seat 66 J has limited recline. The proximity to the lavatory may be bothersome. 66 K None No Power Seat 66 K has limited recline. The proximity to the lavatory may be bothersome. 67 B None No Power Seat 67 B has extra legroom. The proximity to the lavatory may be bothersome. 67 C None No Power Seat 67 C has extra legroom. The proximity to the lavatory may be bothersome. 67 D None No Power Seat 67 D has extra legroom. The proximity to the lavatory may be bothersome. There is a bassinet location here, so passengers traveling with infants are often seated in this row. 67 E None No Power Seat 67 E has extra legroom. The proximity to the lavatory may be bothersome. There is a bassinet location here, so passengers traveling with infants are often seated in this row. 67 F None No Power Seat 67 F has extra legroom. The proximity to the lavatory may be bothersome. There is a bassinet location here, so passengers traveling with infants are often seated in this row. 67 G None No Power Seat 67 G has extra legroom. The proximity to the lavatory may be bothersome. There is a bassinet location here, so passengers traveling with infants are often seated in this row. 67 H None No Power Seat 67 H has extra legroom. The proximity to the lavatory may be bothersome. 67 J None No Power Seat 67 J has extra legroom. The proximity to the lavatory may be bothersome. 68 A None No Power Seat 68 A has extra legroom. 68 B None No Power Seat 68 B is a standard Economy seat. 68 C None No Power Seat 68 C is a standard Economy seat. 68 D None No Power Seat 68 D is a standard Economy seat. 68 E None No Power Seat 68 E is a standard Economy seat. 68 F None No Power Seat 68 F is a standard Economy seat. 68 G None No Power Seat 68 G is a standard Economy seat. 68 H None No Power Seat 68 H is a standard Economy seat. 68 J None No Power Seat 68 J is a standard Economy seat. 68 K None No Power Seat 68 K has extra legroom. 69 A None No Power Seat 69 A is a standard Economy seat. 69 B None No Power Seat 69 B is a standard Economy seat. 69 C None No Power Seat 69 C is a standard Economy seat. 69 D None No Power Seat 69 D is a standard Economy seat. 69 E None No Power Seat 69 E is a standard Economy seat. 69 F None No Power Seat 69 F is a standard Economy seat. 69 G None No Power Seat 69 G is a standard Economy seat. 69 H None No Power Seat 69 H is a standard Economy seat. 69 J None No Power Seat 69 J is a standard Economy seat. 69 K None No Power Seat 69 K is a standard Economy seat. 7 A None No Power Seat 7 A is a standard Business seat with extra legroom. 7 E None No Power Seat 7 E is a standard Business seat. 7 K None No Power Seat 7 K is a standard Business seat with extra legroom. 70 A None No Power Seat 70 A is a standard Economy seat. 70 B None No Power Seat 70 B is a standard Economy seat. 70 C None No Power Seat 70 C is a standard Economy seat. 70 D None No Power Seat 70 D is a standard Economy seat. 70 E None No Power Seat 70 E is a standard Economy seat. 70 F None No Power Seat 70 F is a standard Economy seat. 70 G None No Power Seat 70 G is a standard Economy seat. 70 H None No Power Seat 70 H is a standard Economy seat. 70 J None No Power Seat 70 J is a standard Economy seat. 70 K None No Power Seat 70 K is a standard Economy seat. 71 A None No Power Seat 71 A is a standard Economy seat. 71 B None No Power Seat 71 B is a standard Economy seat. 71 C None No Power Seat 71 C is a standard Economy seat. 71 D None No Power Seat 71 D is a standard Economy seat. 71 E None No Power Seat 71 E is a standard Economy seat. 71 F None No Power Seat 71 F is a standard Economy seat. 71 G None No Power Seat 71 G is a standard Economy seat. 71 H None No Power Seat 71 H is a standard Economy seat. 71 J None No Power Seat 71 J is a standard Economy seat. 71 K None No Power Seat 71 K is a standard Economy seat. 72 A None No Power Seat 72 A is a standard Economy seat. 72 B None No Power Seat 72 B is a standard Economy seat. 72 C None No Power Seat 72 C is a standard Economy seat. 72 D None No Power Seat 72 D is a standard Economy seat. 72 E None No Power Seat 72 E is a standard Economy seat. 72 F None No Power Seat 72 F is a standard Economy seat. 72 G None No Power Seat 72 G is a standard Economy seat. 72 H None No Power Seat 72 H is a standard Economy seat. 72 J None No Power Seat 72 J is a standard Economy seat. 72 K None No Power Seat 72 K is a standard Economy seat. 73 A None No Power Seat 73 A is a standard Economy seat. 73 B None No Power Seat 73 B is a standard Economy seat. 73 C None No Power Seat 73 C is a standard Economy seat. 73 D None No Power Seat 73 D is a standard Economy seat. 73 E None No Power Seat 73 E is a standard Economy seat. 73 F None No Power Seat 73 F is a standard Economy seat. 73 G None No Power Seat 73 G is a standard Economy seat. 73 H None No Power Seat 73 H is a standard Economy seat. 73 J None No Power Seat 73 J is a standard Economy seat. 73 K None No Power Seat 73 K is a standard Economy seat. 74 A None No Power Seat 74 A is a standard Economy seat. 74 B None No Power Seat 74 B is a standard Economy seat. 74 C None No Power Seat 74 C is a standard Economy seat. 74 D None No Power Seat 74 D is a standard Economy seat. 74 E None No Power Seat 74 E is a standard Economy seat. 74 F None No Power Seat 74 F is a standard Economy seat. 74 G None No Power Seat 74 G is a standard Economy seat. 74 H None No Power Seat 74 H is a standard Economy seat. 74 J None No Power Seat 74 J is a standard Economy seat. 74 K None No Power Seat 74 K is a standard Economy seat. 75 A None No Power Seat 75 A is a standard Economy seat. 75 B None No Power Seat 75 B is a standard Economy seat. 75 C None No Power Seat 75 C is a standard Economy seat. 75 D None No Power Seat 75 D is a standard Economy seat. 75 E None No Power Seat 75 E is a standard Economy seat. 75 F None No Power Seat 75 F is a standard Economy seat. 75 G None No Power Seat 75 G is a standard Economy seat. 75 H None No Power Seat 75 H is a standard Economy seat. 75 J None No Power Seat 75 J is a standard Economy seat. 75 K None No Power Seat 75 K is a standard Economy seat. 76 A None No Power Seat 76 A is a standard Economy seat. 76 B None No Power Seat 76 B is a standard Economy seat. 76 C None No Power Seat 76 C is a standard Economy seat. 76 D None No Power Seat 76 D is a standard Economy seat. 76 E None No Power Seat 76 E is a standard Economy seat. 76 F None No Power Seat 76 F is a standard Economy seat. 76 G None No Power Seat 76 G is a standard Economy seat. 76 H None No Power Seat 76 H is a standard Economy seat. 76 J None No Power Seat 76 J is a standard Economy seat. 76 K None No Power Seat 76 K is a standard Economy seat. 77 A None No Power Seat 77 A is a standard Economy seat. 77 B None No Power Seat 77 B is a standard Economy seat. 77 C None No Power Seat 77 C is a standard Economy seat. 77 D None No Power Seat 77 D is a standard Economy seat. 77 E None No Power Seat 77 E is a standard Economy seat. 77 F None No Power Seat 77 F is a standard Economy seat. 77 G None No Power Seat 77 G is a standard Economy seat. 77 H None No Power Seat 77 H is a standard Economy seat. 77 J None No Power Seat 77 J is a standard Economy seat. 77 K None No Power Seat 77 K is a standard Economy seat. 78 A None No Power Seat 78 A is a standard Economy seat. 78 B None No Power Seat 78 B is a standard Economy seat. 78 C None No Power Seat 78 C is a standard Economy seat. 78 D None No Power Seat 78 D has limited recline. The proximity to the galley may be bothersome. 78 E None No Power Seat 78 E has limited recline. The proximity to the galley may be bothersome. 78 F None No Power Seat 78 F has limited recline. The proximity to the galley may be bothersome. 78 G None No Power Seat 78 G has limited recline. The proximity to the galley may be bothersome. 78 H None No Power Seat 78 H is a standard Economy seat. 78 J None No Power Seat 78 J is a standard Economy seat. 78 K None No Power Seat 78 K is a standard Economy seat. 79 A None No Power Seat 79 A has limited recline. The proximity to the galley may be bothersome. 79 B None No Power Seat 79 B has limited recline. The proximity to the galley may be bothersome. 79 C None No Power Seat 79 C has limited recline. The proximity to the galley may be bothersome. 79 H None No Power Seat 79 H has limited recline. The proximity to the galley may be bothersome. 79 J None No Power Seat 79 J has limited recline. The proximity to the galley may be bothersome. 79 K None No Power Seat 79 K has limited recline. The proximity to the galley may be bothersome. 8 B None No Power Seat 8 B is a standard Business seat. 8 G None No Power Seat 8 G is a standard Business seat. 8 J None No Power Seat 8 J is a standard Business seat. 80 B None No Power Seat 80 B has extra legroom. The proximity to the galley may be bothersome. 80 C None No Power Seat 80 C has extra legroom. The proximity to the galley may be bothersome. 80 H None No Power Seat 80 H has extra legroom. The proximity to the galley may be bothersome. 80 J None No Power Seat 80 J has extra legroom. The proximity to the galley may be bothersome. 81 A None No Power Seat 81 A has extra legroom. 81 B None No Power Seat 81 B is a standard Economy seat. 81 C None No Power Seat 81 C is a standard Economy seat. 81 H None No Power Seat 81 H is a standard Economy seat. 81 J None No Power Seat 81 J is a standard Economy seat. 81 K None No Power Seat 81 K has extra legroom. 82 A None No Power Seat 82 A is a standard Economy seat. 82 B None No Power Seat 82 B is a standard Economy seat. 82 C None No Power Seat 82 C is a standard Economy seat. 82 D None No Power Seat 82 D has extra legroom. There is a bassinet location here, so passengers traveling with infants are often seated in this row. 82 E None No Power Seat 82 E has extra legroom. There is a bassinet location here, so passengers traveling with infants are often seated in this row. 82 F None No Power Seat 82 F has extra legroom. There is a bassinet location here, so passengers traveling with infants are often seated in this row. 82 G None No Power Seat 82 G has extra legroom. There is a bassinet location here, so passengers traveling with infants are often seated in this row. 82 H None No Power Seat 82 H is a standard Economy seat. 82 J None No Power Seat 82 J is a standard Economy seat. 82 K None No Power Seat 82 K is a standard Economy seat. 83 A None No Power Seat 83 A is a standard Economy seat. 83 B None No Power Seat 83 B is a standard Economy seat. 83 C None No Power Seat 83 C is a standard Economy seat. 83 D None No Power Seat 83 D is a standard Economy seat. 83 E None No Power Seat 83 E is a standard Economy seat. 83 F None No Power Seat 83 F is a standard Economy seat. 83 G None No Power Seat 83 G is a standard Economy seat. 83 H None No Power Seat 83 H is a standard Economy seat. 83 J None No Power Seat 83 J is a standard Economy seat. 83 K None No Power Seat 83 K is a standard Economy seat. 84 A None No Power Seat 84 A is a standard Economy seat. 84 B None No Power Seat 84 B is a standard Economy seat. 84 C None No Power Seat 84 C is a standard Economy seat. 84 D None No Power Seat 84 D is a standard Economy seat. 84 E None No Power Seat 84 E is a standard Economy seat. 84 F None No Power Seat 84 F is a standard Economy seat. 84 G None No Power Seat 84 G is a standard Economy seat. 84 H None No Power Seat 84 H is a standard Economy seat. 84 J None No Power Seat 84 J is a standard Economy seat. 84 K None No Power Seat 84 K is a standard Economy seat. 85 A None No Power Seat 85 A is a standard Economy seat. 85 B None No Power Seat 85 B is a standard Economy seat. 85 C None No Power Seat 85 C is a standard Economy seat. 85 D None No Power Seat 85 D is a standard Economy seat. 85 E None No Power Seat 85 E is a standard Economy seat. 85 F None No Power Seat 85 F is a standard Economy seat. 85 G None No Power Seat 85 G is a standard Economy seat. 85 H None No Power Seat 85 H is a standard Economy seat. 85 J None No Power Seat 85 J is a standard Economy seat. 85 K None No Power Seat 85 K is a standard Economy seat. 86 A None No Power Seat 86 A is a standard Economy seat. 86 B None No Power Seat 86 B is a standard Economy seat. 86 C None No Power Seat 86 C is a standard Economy seat. 86 D None No Power Seat 86 D is a standard Economy seat. 86 E None No Power Seat 86 E is a standard Economy seat. 86 F None No Power Seat 86 F is a standard Economy seat. 86 G None No Power Seat 86 G is a standard Economy seat. 86 H None No Power Seat 86 H is a standard Economy seat. 86 J None No Power Seat 86 J is a standard Economy seat. 86 K None No Power Seat 86 K is a standard Economy seat. 87 A None No Power Seat 87 A is a standard Economy seat. 87 B None No Power Seat 87 B is a standard Economy seat. 87 C None No Power Seat 87 C is a standard Economy seat, however, the proximity to the lavatory may be bothersome. 87 D None No Power Seat 87 D is a standard Economy seat, however, the proximity to the lavatory may be bothersome. 87 E None No Power Seat 87 E is a standard Economy seat. 87 F None No Power Seat 87 F is a standard Economy seat. 87 G None No Power Seat 87 G is a standard Economy seat, however, the proximity to the lavatory may be bothersome. 87 H None No Power Seat 87 H is a standard Economy seat, however, the proximity to the lavatory may be bothersome. 87 J None No Power Seat 87 J is a standard Economy seat. 87 K None No Power Seat 87 K is a standard Economy seat. 88 A None No Power Seat 88 A has limited recline. The proximity to the lavatory may be bothersome. 88 B None No Power Seat 88 B has limited recline. The proximity to the lavatory may be bothersome. 88 C None No Power Seat 88 C has limited recline. The proximity to the lavatory may be bothersome. 88 D None No Power Seat 88 D has limited recline. The proximity to the lavatory may be bothersome. 88 E None No Power Seat 88 E has limited recline. The proximity to the lavatory may be bothersome. 88 F None No Power Seat 88 F has limited recline. The proximity to the lavatory may be bothersome. 88 G None No Power Seat 88 G has limited recline. The proximity to the lavatory may be bothersome. 88 H None No Power Seat 88 H has limited recline. The proximity to the lavatory may be bothersome. 88 J None No Power Seat 88 J has limited recline. The proximity to the lavatory may be bothersome. 88 K None No Power Seat 88 K has limited recline. The proximity to the lavatory may be bothersome. 9 A None No Power Seat 9 A is a standard Business seat. 9 E None No Power Seat 9 E is a standard Business seat. 9 F None No Power Seat 9 F is a standard Business seat. 9 K None No Power Seat 9 K is a standard Business seat. Each seat is equipped with personal Audio Visual on Demand (AVOD) via Emirates' ICE entertainment system. There is an extensive menu of audio and music tracks available. 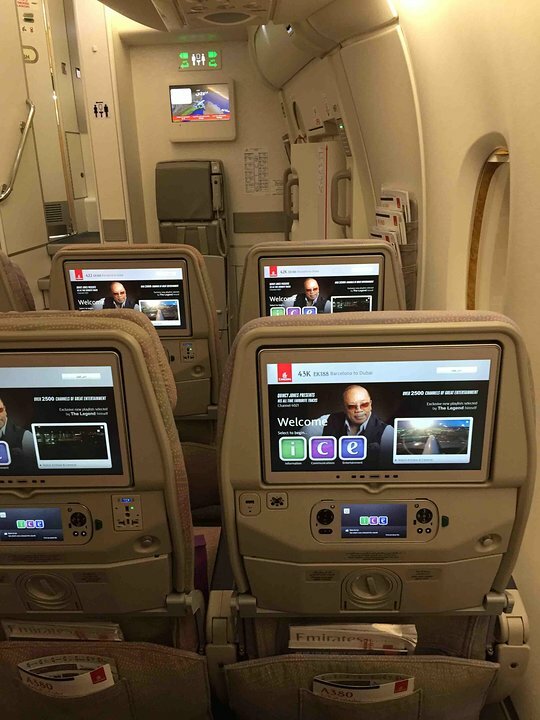 Each seat is equipped with personal Audio Visual on Demand (AVOD) via Emirates' ICE entertainment system. There is an extensive menu of movies, television programmes and video games available. Every First and Business Class seat is equipped with a regular 110v AC power port. In Economy, the power ports are located between the seats. This aircraft features a WiFi hotspot provided by OnAir, which allows passengers to pay for internet access using their credit cards. Emirates was the second airline to operate the Airbus A380-800 aircraft and currently has three versions of the A380 with slightly different configurations. This version has a total of 14 First Class seats, 76 Business Class seasts, and 427 Economy Class seats. To verify the correct version of the A380 at the time of booking or at online checking, the follow rows may be used as reference: Economy begins at row 41 on the main deck and ends at row 88; Business Class ends at row 26 on the upper deck. This aircraft operates with three classes of service. First Class are individual suites with sliding doors. There is also a shower for First Class passengers. Business Class is in a staggered pattern with most seats having direct access to the aisle and a pair of seats down the centre. Economy Class is located entirely on the main deck of the aircraft. Every seat is equipped with inflight power and individual entertainment. SEATS 23A, 22D, 22G and 23K are ALL STANDARD business class seats. I have been Manchester-Dubai-Singapore and return 11 times to now (total of 44 flights (aeroplanes) Not ONE of those flights had EXTRA leg room. All are standard size and all have a Bulk head immediately in front. I choose 23A or 25A because this bulkhead makes a small compartment and I am not 1) looking at the wing blocking the view, and 2) I am not looking down the entire aircraft. So NO extra leg room, and a decent view outside. The seat was terrible - along with the limited recline, there are chiller units above your head which create a loud whirring noise, which spools up for about a second, every other second, for all 7 hours of a flight back from Dubai to London. I travelled back from Dubai and was seated near the toilets. The smell was disgusting and I felt sick for most of the flight. It is about to happen again in seat 65K. Tomorrow. Because I am a single flyer and I can't afford to pay extra for my seat, my seat is always changed when boarding. I am so fed up being treated as if I don't matter. The seat overall is fine, plenty of room and I am 6ft 225lbs. My issue was with the traffic, the galley is right there and I did not mind the girls working during meak times. It was the disrespectful passengers that stand around in the exit area and speak loudly disturbing seated passengers. This should be curtailed by airline crew to allow only minimal time for stretching, not spending half the flight there yelling to converse. 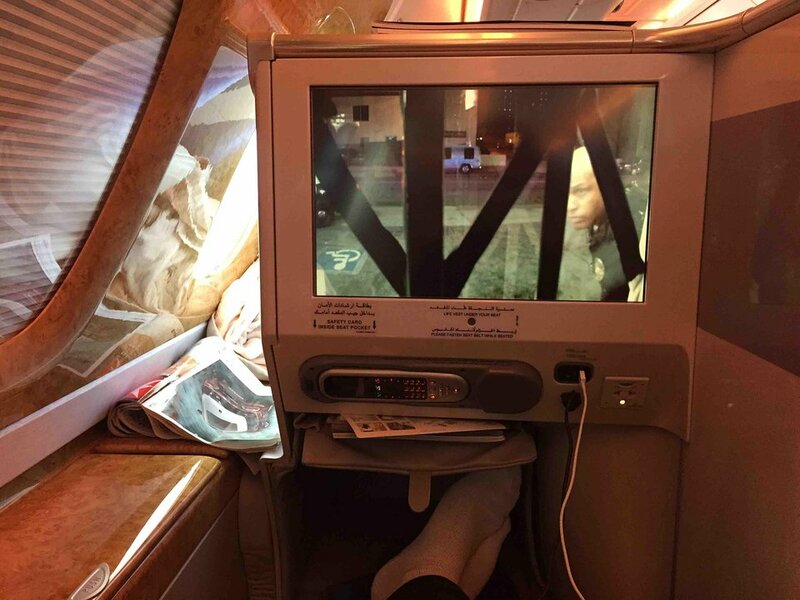 A terrible flight from DXB-LAX. Will never sit there again. You would think you have extra leg room but the bulky door which holds the life raft blocks your ability to spread your legs entirely. Pick 41H or 41J and 41K will be very jealous. 41A also has this problem. 41B and 41C are good! Best flight I've ever had. Plenty of space, very comfortable seat, good window view. All seats in this part of the cabin (row 41 down to 50) are super silent, which is an important factor for me. Seats 41A and 41K do not have a window, which is not marked in the V2 version map of SeatGuru. To me this would be super annoying, with the wall next to you but no chance to look out. Best seat I've ever had! Hard and soft product were stellar. Bar was great. Since the flight was just a 2.5 hour hop from Sydney to Christchurch, the business cabin was mostly empty while many pax opted for the nearly full economy cabin on this short to medium haul. The A and K seats are perfect for travelling alone since they provide extra privacy from the aisle and cabin compared to the B and J seats. Great seat for economy. All the leg room you need but set back from the bulkhead and away from people standing around the toilets. You don't have to crawl over anyone to get out despite being a window seat. My favorite seat in economy. Do NOT pay extra for seat 41K (or seat 41A). The seats are not as wide as standard seats. Yes, you can stretch your legs out, but you have to have the extrusion of a door in front of you, so you have to bend your legs at an angle. It's also a bit tight to get in and out of the seats. The seats are good, but should be charged at the same rate as the other "extra legroom" seats. Smoothest flight you can experience. Like a big ship on a very calm ocean. Enjoyed it. Extra legroom...... if you only have a left leg!! Paid same as other 2 "extra legroom" seats next to me to!! This seat is also narrower than the two adjacent ones as well as having restricted left leg room. Wonderful service the business class lounge and direct access onto the plane was excellent. My biggest complaint is with the fold out tables; unless you slim or medium build they dig into your stomach when folded down. The Emirates 380 Business Class seats have a width of 18.5 inches, which is half an inch wider than the economy class. This makes the seats narrow. While the seats are lie-flat, it makes it impossible to turn in the seat while lying down, making it very uncomfortable when on a long flight. Of the 9 airlines that I have flown in Business Class, Emirates has the narrowest seats. Compare this with SQ which has seats of upto 30 inches. The seat plan is not correct. There are actually 8 seats across in Emirates Business Class and not 4 seats as shown. A more accurate seat plan for this aircraft is the Etihad 380 Business Class. The plane from London to Dubai was very busy with not many empty seats. This seat was near the back of the plane, so i was one of last to get off. This section was small and relatively quiet. Food and entertainment were very good. Wow, this is by far the best seat in the house & it feels like First Class for it is so private plus you have your own window. This is the very best money can buy! Front part of the plane (rows 41-50) is quieter as the engines are less heard than in the other sections of the lower deck. just equadestant between wing and bar and toilets Quiet and smooth take off and landing. Loved it especiially as i am a nervous flyer traveling by myself for such a lond distance by myself. Will be doing again later this year. This part of the aircraft seemed much more peaceful than an earlier experience in seat 72J. Not so many people going back and forth to the toilets. Not so much noise. Additionally I had a greater sense of space. Business class seat. Very good regarding space and comfort. However if you can go for those with an A (14A, 16A, 18A,...) as you will have a bit more privacy while sleeping or enjoying entertainment system. Multiple problems with this seat. Hard container under seat pushes swab into thighs and calves forward - very uncomfortable. Strong light spill from purser's office beside you plus light from stairs, toilets, status boards. Half-sized overhead storage bins. Try to avoid 14A especially if you are hoping for prompt cabin service in Business Class. There was confusion among cabin crew on who was serving my seat. I had to continuously ask for items, which meant I missed out of my first choice of meals. The cabin was tired and needed a clean. Overall very disappointed. WHile this seat has extra leg room and is less close to the toilets than other bulkhead seats , due to the stairs , it does have drawbacks. I would not class it as a 'good' seat. Because of the stairs the row of four doesn't have 'wall' / bulkhead in front of the whole row. the two ailse seats . d& g are literally hanging out in the aisle . Passengers walking from the toilets towards back of the plane are walking literally stairght towards this seat and the ailse along side is narrow in this spart of the plane. A single bassinet is located on the wall meaning you are far from your baby in either aisle seat. Being a very modern plane you expect improvements. In fact it's the opposite. Old B777 is way better than this. TV screen merely 25 cm wide (more than 30 cm on B777). Screen is not responsive and tends to hang. It's not only me having these problems a lot of passengers are complaining. Leg room is inferior. And also very hard to recline. This aircraft is a shame. This was amazing service. I also wanted to recommend to everyone - try united polaris businessfirst class! Flight from DXB-CDG. Seat 67H. I am a male 185cm, 95 Kgs, athletic. Seat: as all the exit rows, the seat is narrower than the others economy class seats. TV can't be used for taxi, taking off and landing. The duo combination for the exit row seats is great. I had a free seat next to me (67J) so i switched and spent the whole on this seat. If you can be on row 67, take seat B or J, so that you are not on the aisle. This will avoid anyone to bump onto you or your TV. Plus you will have a free space toward the side of the plane. If you are in Economy class. Try to seat as close as you can to the front of the plane. CDG has really slow immigration where the passengers of this flight will go through. 2-4 agents for a whole A380 plane, and sometimes it takes up to an hour to go through immigration.... Storage: Above seat storage is pretty much rare. Cabin crew usually have their luggage already on storage 67. Store your carry on on one of the earlier rows if you can (65-64) rather than rows behind. Makes it easier when leaving the plane. Bothersome: your are next to the lavatories, so there will be a bit of traffic after the meal times. But not really annoying, I had my legs stretched the whole time and people could still wait in front of me. However I wouldn't recommend the seat D and G. People are really waiting on your feet. Food: food is okay. could be a bit more food on the plate. I have flew a lot from New Zealand and France and now i always have my own meal. I don't think any airline feed well enough unless you are in Business Class. A380: surely my favourite. The quietness of the plane is much appreciated. My 7 hours from Dubai to Paris were far quieter than my 17 hours between Auckland and Dubai with a 777. The company is really good in my opinion. The crew was really friendly. Out of my many flights with Emirates i had once a bad crew member. i raised the issue to them during the flight and only communicated with the other crew members. Was much better. I have flown business class three times now with this airline. My favoutite seat to date has been this one. I have also been in 7a and 9j business class and 50a and 50k in economy. This seat is near the front of the business section snd next to a window. I felt it to be very private due to its locality snd also as you do not get footfall to the toliets or bar at the back of the plane. Without exception all crew on all my flights have been wonderful, how they keep smiling all the time is amazing. I found the food ok on the flights but not as good as in the business lounges. The soace around the seat was good and the comfort of the seat laid flat with the mattress on it was very good.This is my prefered airline to fly with to Sydney and i will keep flying with them as the price structure for what you get is good. I stood down on my last flight and was given a free return flight to Sydney from Manchester, wonderful! This seat is great. I love the first class cabin and everything is great. I would prefer extra leg space but the rest is great. I dont know why people are so picky! This seat is adjacent to the Pursers office and staff tend to congregate here during the flight. Great seats, but they are next to the Galley. Good for daytime flights, not so good for nighttime flights. No USB or power outlets so come fully charged up. No extra legroom plus noisy due to proximity to galley plus crew storage cupboards, in addition close to bassinet seats so potential baby noise. The seats for at the bulkhead also provide a shortcut for cabin crew and impatient people wanting to use the toilets that swap sides. This means constant wake ups due to people tripping over your feet while sleeping. Not recommended. Well so far this year have flown 12 trips with Emirates A380. Eleven were in economy and apart from children (noise & running about) it has been comfortable trips. Albeit if you are in the rear engine noise is intrusive. Fortunate I was bumped to Business on MRU/DUB leg and what a experience. Seat 17G, cabin staff as always excellent, but now they call you by name, collect your drinks order and provide quality service. Seat bed reclined to whatever position you needed. After dinner and a sleep, I checked out the bar area. Yes it is like the promo video. Laughing happy people, CC mixing in, taking photos. Plenty of food and drinks, all premium. This was an eye opener as how to fly. Booked BC March on four legs to from Mauritius. That's how good it is. PS avoid Ems 777, cattle trucks. Whoever says the proximity of the bar is an issue has, with great respect, never sat in this seat. I have never been aware of anyone using the bar - excellent quality though it is. Great seat,plenty of room for economy. Window on a380 are very small with a deep recess also the window seat is not great if you like to lean against the side trying to sleep. Entertainment system really good,tons of choice for everyone. On the four flights i had on this aircraft the food was pretty poor,very bland,certainly had far better on other airlines. The biggest let down by far was the cabin crew, rude,unhelpfull,obnoxious, by far the worst airline cabin crew ive experienced. Feet really cold all flight due to a continuous draught. Unable to stretch legs out straight due to bulkhead and door.Pity some of the crew hadn't learnt to say "please"and"thank you"and didn't appreciate having my meal tray practically thrown at me. Sorry but the "emirates experience" is not all its made out to be. A380 itself is pretty impressive,quiet and smooth. Seats had plenty of legroom and great entertainment,large screens with huge choice of films/tv/music. The windows are actually very small and have a deep recess from the inner screen, the wall curves outwards,great for space but not so good if you want to lean against to try and sleep,also the leg support for the seats in front is right where your foot naturally would be,foot rests would be nice. The food was below average in my opinion,had far better on other airlines. Cabin crew were not very good at all,some were rude while others made you feel bad for daring to ask for anything,not impressed at all. So, seat = 7/10 . Entertainment = 10/10 . Food = 4/10 .cabin crew/service =3/10. This is based on 4 flights Lgw-Dxb-Hkg and return, nov 2015. I saw one comment which said that the A380 Business was worse than Easyjet. That person doesn't sound as though he/she has flown business anywhere. 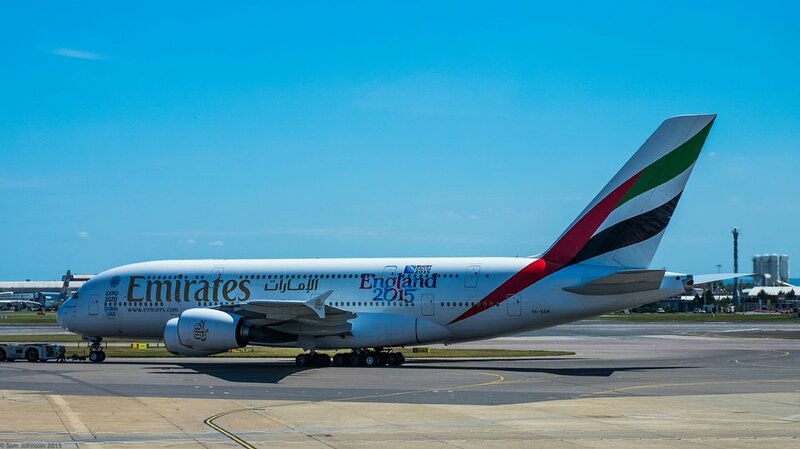 I have used the A380 Business twice on long haul from Dubai to Auckland and return, Dec 2014 returning Feb 2015. Superb seats, service, entertainment and general comfort. Managed to sleep for the first time on any aircraft in 50 years of flying. We are flying in one again on the same trip in a few weeks time and looking forward to it. Happened to be Emirates. The seat was very comfortable. The legroom was pretty good for econkmy. The entertainment system worked really well. This seat is great and would recommend it to others. I flew Emirates in seat 48C. The 380 is extremely spacious and quite. My seat was great. The only problem is that it doesn't have AC power, which could be an issue. Food is superior to every other airline company and staff was friendly and professional. Best Economy flight I ever had. Great legroom and space even when seat in front is fully reclined. The entertainment was way better then the ones of Lufthansa and Qatar Airways. The Screens were enormous and in HD and also the remote was on the newest stand. The free Wifi was perfectly working and the service was standard. I was upgraded into this seat which was fine. However if I had paid for a business class ticket and allocated this seat I would be very very unhappy. I sat in 49G and my Mum was in 49F. We were very comfortable on the trip between Australia and Europe. Excellent amount of space for an economy seat, and the in-flight entertainment system, and points for charging devices were very good. I would be very happy to fly economy in this plane again. Great seat at the aisle. Both leg room and width were perfect given the price. 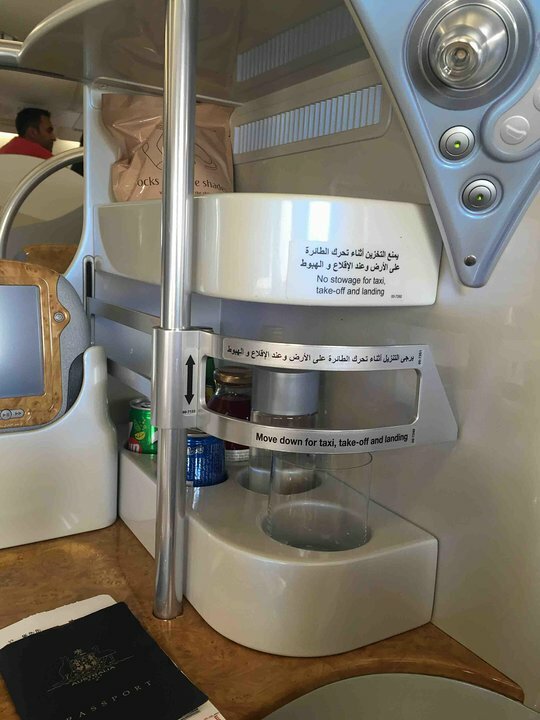 Emirates ICE system is a blast to use and makes a long trip enjoyable. Not to mention the huge, pivoting overhead bins. Cabin was very quiet and service great. This seat has abit more legroom due to the bulkhead just in front of it. Only issue one could have is noise from the bar area behind you. I have done this route a few times and find it the best seat, if already booked I try 20K as both seats are behind wings so you have a view. The worst buisness class seat every. It was no better than any a easy jet flight in front of the bulk head. The crew change to flight attire in full view which is not there fault,and the locker door with there clothes in, when in use ,is very noisy,needs dampers or stops to soften the noise it woke me up. Basically the 380 is just to big and the crew cannot offer the quick service you receive on a 747. I travelled back from DXB to SYD in this aisle seat in the front cabin and the difference to the Qantas A380 (though I hate to admit it) was amazing. Emirates A380 economy seats have more legroom, more width and overall more personal space with excellent huge TV screens and movie choice. Had flown Qantas on the way over so it was a good comparison - Emirates food was much much better, crew were very attentive if not as friendly as Qantas but Qantas crew more laid back and lazy. I suppose the one good thing to come out of the Qantas/Emirates tie up is that you get to sample another quality airline for the same price and see what you're missing. I never thought I's say it but if I am travelling economy I will try and book Qantas and choose and Emirates flight from now on! more Spacious then other seats in business and you are the first to receive your meal. If you want to feel as if on your own (private jet) 1K&A are isolated as they are forward than the same row and bordered by the curtain leading to the 1st class bar & showers which are amazing. Service is outstanding although seat is a bit narrow but the suite offer heaven in the sky. Seat 2K&A have a view of the cabin & offer a less isolated situation. Above row 78 is an overhanging duct containing a hatch labeled "Chiller Fan access". This fan switches on and off, in a random pattern, from push-back to landing, with an extremely unsettling very loud whine. Emirates refuse redress. Avoid. Also, the A380 invariably lands with a brain-jarring crunch and clatter. And it skitters and judders in turbulence. Dire experience, nothing like the solidity of a 747. The seat as well as others on this side are excellent. They provide a small mattress that takes away the seat creases and makes a comfortable bed. Esp. useful if tired. There is a lounge at the rear of business class far enough away that you are not disturbed by the noise..
narrow gangway here leading to the galley meant that EVERY person, large or small, hit the seat and TV screen. It was a pretty noisy seat but did have great leg room - not sure I'd want this seat for a night flight though. On Emirates seat plan when booking, seats 66J and 66K are shown as two seats with 66H missing. This is not the case as it is a standard 3 seat row which includes seat 66H. You would be hard pressed to find a bad economy seat on board. If you are addicted to looking out a window, be sure you sit in front of or behind the wing. The wing is so wide, if you are over it you see noting. External cameras run from the departure gate to the arrival gate, it is amazing you see everything. We use the a380, economy section as our 3 hour shuttle from Sydney to Auckland. We are Business class fliers except on this aircraft and airline, service and equipment are beyond other economy experiences except maybe QANTAS. This seat was very comfortable,for sitting and sleeping for a mature slightly over weight person. With a nice exercising walk to the rear toilets and friendly bar area. It is just so private in your own little pod, but in Business class. The seats are hard with limited leg room and compare with 'cut price' airlines [e.g. Jetstar in Australia.] The feeling was that the maximum number of seats are squeezed into Economy. I was in seat 1E an open suite on my flight from JFK New York to DXB Dubai and it was the most amazing flight i've ever been on the hospitality was just unreal it was like nothing i've ever experienced before. It was an experience of a life time. 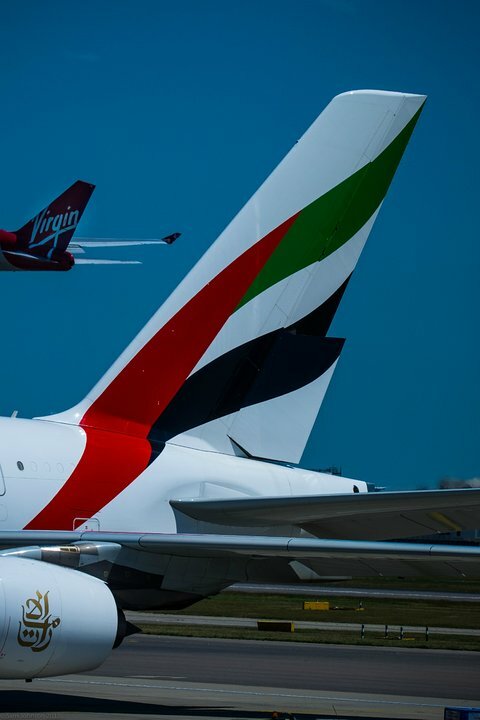 Emirates flies 3 versions of A380-800 Vers 1.